Retreat to Grand Residences by Marriott, Lake Tahoe. Located within the Heavenly Village in South Lake Tahoe, CA, our premium vacation ownership resort offers well-appointed guest rooms, studios and one- and two-bedroom residence rentals. Our residences offer all the comforts of home, with a full kitchen, separate living and dining areas and a cozy fireplace. Enjoy complimentary Wi-Fi in all accommodations. Gather with family or friends at Fire + Ice Grill and Bar for Asian cuisine and cocktails. Indulge in a massage or beauty treatment at our Serenity Spa. Take a dip in the heated outdoor pool or break a sweat in our modern fitness center. Our South Lake Tahoe resort offers modern meeting spaces for events up to 50 attendees. 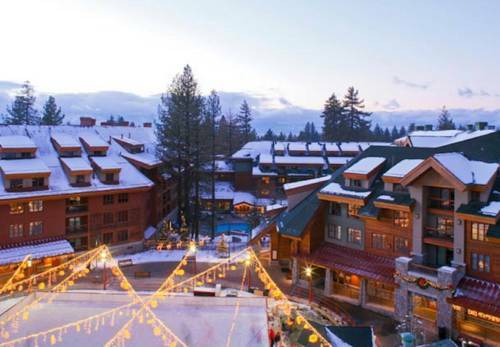 Enjoy world-class skiing at Heavenly Ski Resort or explore theaters, shops and restaurants at Heavenly Village. Lake Tahoe, Emerald Bay and Mt. Tallac Trail are nearby for even more recreation. We look forward to welcoming you at our premium vacation resort in Lake Tahoe, CA..